How should I calculate lost wages in a car accident claim? In a car accident claim, lost wages are often an important part of the settlement. Wages can be calculated in several different ways, depending on your employment type. Take your hourly wage and multiply it by the number of hours missed due to your accident-related injuries. For example, if your hourly wage is $25, and you missed work for 4 days (8 hours per day), your calculation would be: $25 x (8 hours x 4 days) = $800. If you don't always work the same amount of hours each week, you can calculate lost wages using an average of the amount of hours worked from the last two to three months. If overtime is included in your variable hours, you will need documentation from your employer stating that overtime is a regular part of your work schedule. Otherwise, the assumption is that overtime pay is not guaranteed. If you are a salaried employee, calculate lost wages by taking your yearly salary and dividing it by 2,080 (number of work hours in a year). Then, multiply this number by the hours missed due to your accident-related injuries. For example, if your yearly salary is $50,000, and you missed 10 days of work, your calculation would be: ($50,000 / 2,080) x (8 hours x 10 days) = $1,923.08. If you're an independent contractor or self-employed business owner, you can claim lost income instead of lost wages, as part of your damages. This refers to the earnings and profits you would have made if you weren't injured in the accident. Some of the proof you can use for this type of claim includes tax returns, 1099 forms, business correspondence, invoices, or receipts that show specific amounts of lost income. If you have been left with a permanent disability, you may be unable to return to work, work part time, or work in a lower paying occupation. In this case, your attorney can line up expert witnesses to calculate your loss of future earning potential. Have You Been Injured In A Louisiana Car Accident? If you've been hurt in a car accident you need to speak with an experienced car accident attorney as soon as possible. Please contact us online or call our Alexandria office directly at 318.541.8188 to schedule your free consultation. Who pays for my car accident injuries? 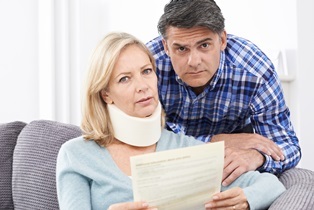 What type of compensation can I recover after a car accident? Why does my lawyer need my personal information? ?How can I use traffic camera footage to support my personal injury claim? ?Why does my lawyer need my personal information?